Heat oven to 375°F. Spray 13x9-inch (3-quart) glass baking dish or 3-quart oval casserole with nonstick cooking spray. Heat oil in large nonstick skillet over medium-high heat until hot. Add carrots and onion; cook and stir 3 minutes. Add chicken; cook 4 to 5 minutes or until chicken is no longer pink in center and vegetables are tender, stirring frequently. 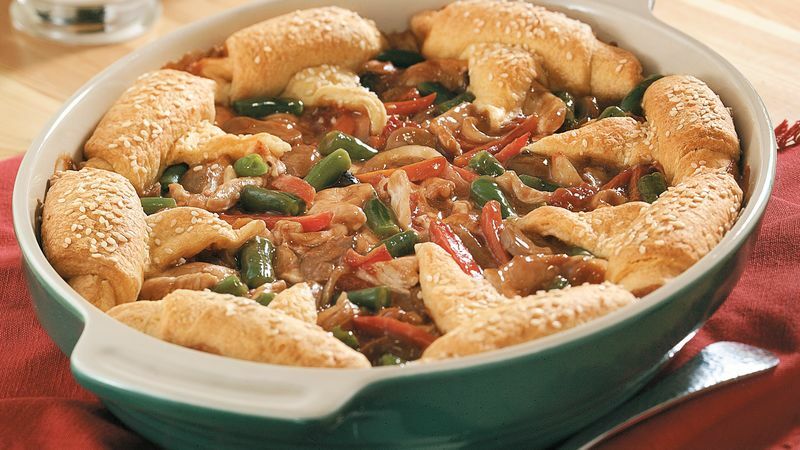 Add green beans, tomatoes and mushrooms; mix well. In small bowl, combine gravy, flour and salt; blend well. Add to chicken mixture; cook and stir until mixture is bubbly. Remove from heat. Pour into sprayed baking dish. Separate dough into 8 triangles. Starting from shortest side of each triangle, roll up halfway; arrange over hot chicken mixture so pointed ends are toward center. Spray rolls with cooking spray; sprinkle with sesame seed. Bake 18 to 23 minutes or until crescent rolls are deep golden brown.